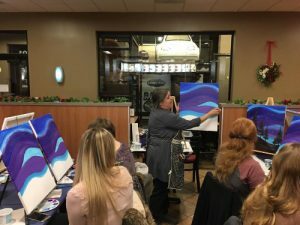 No talent required, Paint Nights are fun for everyone! Our location or yours. We can customize to any theme. Great for all ages. A perfect opportunity for a birthday party, social event, fundraiser or corporate event. All materials included, 16 X 20 canvas is standard, other sizes available. Tables and chairs available for an additional fee. $35 per person, minimum of 6 guests required. Non profit pricing & Fundraiser pricing available upon request.